November 1935. "Auto dump near Easton, Pennsylvania." Large-format nitrate negative by Walker Evans for the Farm Security Administration. View full size. Submitted by Anonymous Tipster on Sun, 05/31/2009 - 2:41pm. Submitted by Michael the Bell on Fri, 05/15/2009 - 3:41pm. Oh I love those old cars. I am a Hot Rodder period. I'm salivating right now to think what I could be doing with those cars. Especially what looks like a 1928 or 1929 Model A Roadster in the middle. Thanks for sharing these images. Submitted by Bob In Texas on Tue, 03/31/2009 - 2:56pm. To stumble upon something like that nowdays would be better than, or as good as, having a small gold mine. Just think what collectors/restorers would pay for some of those. Have a Great Day! Submitted by Anonymous Tipster on Sat, 03/14/2009 - 2:48pm. "Well, that's a fine state of affairs ... what a shame that they couldn't have been stored for posterity." Submitted by librus on Sat, 03/14/2009 - 7:50am. Google translation: No, the cool .... the damage that it could not be the preserve for the future. Submitted by RobertL on Sat, 03/14/2009 - 6:21am. People dreamed of owning those cars when they were new, and we dream of owning them now. The only time they were junk was when the picture was taken. Submitted by stanton_square on Fri, 03/13/2009 - 5:17pm. 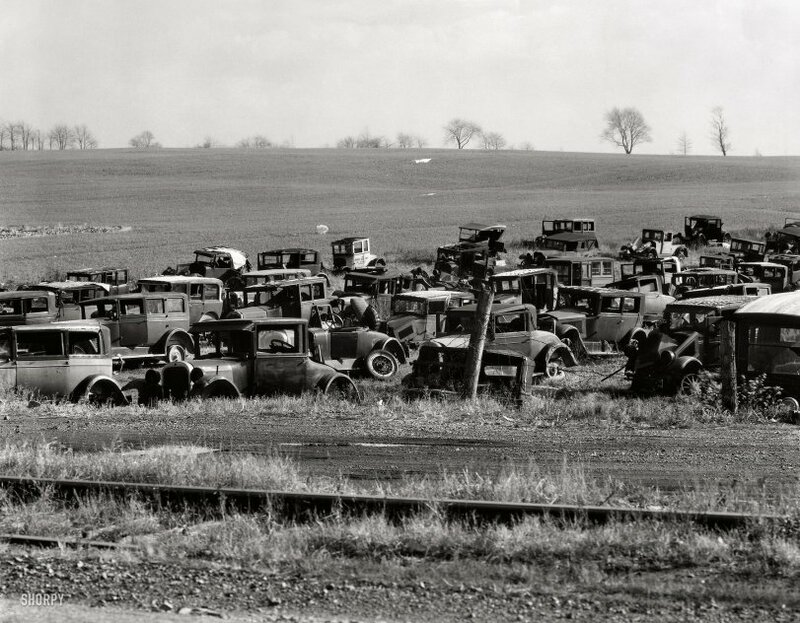 Other places on the web identify this photo as Joe's Auto Graveyard on Route 22. Walker Evans took this photo on November 8, 1935. Submitted by delworthio on Fri, 03/13/2009 - 4:14pm. Whenever WE passed an auto junkyard my brother would say that's where I took driving lessons. Submitted by Anonymous Tipster on Fri, 03/13/2009 - 4:05pm. I bet there are car buffs and hot rodders out there who dream of coming upon a field like that. Submitted by Anonymous Arkie on Fri, 03/13/2009 - 2:12pm. Cars now last much longer, are safer, and more reliable. That's one of the reasons that modern car makers are having so many money woes. The average length of time a car is owned by the initial buyer is now estimated at over 9 years. People just don't see the need to replace "the old buggy" every few years like they would back in the 1950s. Submitted by Anonymous Tipster on Fri, 03/13/2009 - 1:37pm. The driver of a 10-year-old car in 1935 had a vehicle made hopelessly obsolete by major changes in the construction of automobiles, mainly the advent of the all-steel body -- the chassis for most cars in the teens and 1920s was a wooden frame with the metal bits bolted on. Which would rot and flex over time. And then there were the roofs. General Motors introduced the all-metal roof ("Turret Top") around 1935. Up till then, the roofs on closed cars were usually painted canvas stretched tight over a wooden frame. The manufacturers had experimented with sheet metal roofs, but they tended to resonate like a drumhead at certain speeds, which made for a lot of noise and vibration. The answer was giant (and expensive) stamping machines, which made steel roofs that were slightly domed to keep their stiffness. This led in a few short years to a complete reversal in the sales market for open and closed cars. Whereas open cars with folding tops had once been the norm and closed cars with roll-up windows tended to be the more expensive models, the all-steel body enabled the masses to enjoy the advantages of the sealed passenger compartment -- roll-up windows, heated interiors, protection from rain and snow. Other changes included steel instead of wooden wheels, as well as smaller wheels and lower clearance made possible by the construction of thousands of miles of paved highway. Under the hood there were higher-compression engines made possible by the development of higher-octane gasoline, resulting in better acceleration and fuel economy. Submitted by Norm Corliss on Fri, 03/13/2009 - 1:11pm. Most of these seem to be 1924 - 1931 models. I'm sure that many of them are here because they simply wore out. It's not true that they were built better in the old days as per the old adage "they don't make 'em like they used to." Nowadays a car is hardly broken in at 125,000 miles - in the old days, you'd be very lucky to get 60,000. Still, I'd like to have my pick of a few of these to restore or make the hot rod I never finished back in the early 60's. Submitted by Impy on Fri, 03/13/2009 - 12:51pm. In 1935 that was an auto dump. 74 years on that place would be a Rodder's Heaven, and would make the yard owner some pretty good scratch. Doubt we'll say the same about our daily drivers decades from now. Submitted by Anonymous Tipster on Fri, 03/13/2009 - 12:31pm. By 1935 the new cars looked more similar to what we own today than to those shown here. I know -- we had a '35 Stude. These old models became junk -- as you can see here. Submitted by Born40YearsTooLate on Fri, 03/13/2009 - 11:58am. Given that the picture was taken in 1935, I'm shocked at how those cars don't seem to be very old (mostly late '20s to early '30s). Somehow, I doubt this junkyard survived the WWII scrap metal drives. Submitted by Brad on Fri, 03/13/2009 - 11:52am. Today those cars in that condition would be worth a small fortune. Did you notice how none of the cars are totaled like you would see in the salvage yards of today? Submitted by ISO Fords on Fri, 03/13/2009 - 11:48am. A lot of good street rod material there. I was hoping to see a '32 -'34 Ford. Submitted by Anonymous Tipster on Fri, 03/13/2009 - 11:47am. Yeaaaa indeed. They don't all seem to be wrecks -- just past their time. The tires seem to have been spoken for but you just might find a flower vase or two. Submitted by Older than Yoda on Fri, 03/13/2009 - 11:41am. As my dear departed uncle used to say whenever we passed a car junkyard, "Wow! That was one heck of an accident!" Submitted by JazzDad on Fri, 03/13/2009 - 11:30am. Wouldn't you like to walk about there?